On the Kispiox River in British Columbia (especially when the water turns cold in early to mid-October), I predominantly swing flies with sink tips, in a “down-and-across” fashion, in the large classic pools and runs that the river is known for. Also, during warmer water conditions of September, I will use a floating line and lightly dressed wet flies swung within a foot of the water surface or skate dry flies on the surface to rising steelhead. But when I encounter small slots, narrow deep holes, ledges, and pocket water on the Kispiox (that are easily waded to), I quickly switch to techniques and flies that are more commonly used in the Great Lakes; more specifically, short-line-bottom-bouncing or the right-angle-floating-indicator-technique with egg patterns and bead-head nymphs. Both these techniques are ideal for getting a fly dead-drifting on the bottom in a very specific area, which would be difficult to reach with a more traditional approach like swinging a fly. In the Great Lakes (and particularly on the Lake Erie tributaries) similar opportunities present themselves, except short-line nymphing techniques far outweigh the traditional fly swinging opportunities due to the rather small size (and holding areas) of many of these streams. Also, during the course of a long steelhead season in the Great Lakes, the majority of the time these tributaries run cold (at or below 40 degrees F) which are ideal conditions for lethargic steelies to key in on dead-drifted flies. The typical scenario (whether on a British Columbia river or a Great Lakes tributary) is not only to carry a selection of steelhead flies but also as least two fly rod set-ups: a long, limber (6 or 7 weight), high-stick nymphing rod for dead-drifting eggs and nymphs and a stiffer, heavier line weight rod (7 or 8 weight, single handed or switch/small double-handed rod) for swinging flies. Having two rod set-ups (as opposed to one rod) allows the steelheader to more quickly and effectively fish various types of water as it is presented to him whether walk-in wade fishing or on a float trip. The nymphing rod is rigged with a floating Wulff triangle taper fly line and a long leader (the progressive action John Nagy "noodle" fly rod is ideal for this) and the stiffer action swinging rod is rigged with a muti-tip floating fly line and a short leader. Line selection includes a Versi-tip line for single-handed rods and a shooting line/Skagit line for switch/double-handed rods (with various sink tips of different sink rates including full tip, sinking leader or custom made mini-tips). Using the “loop-to-loop” system, these sink tips can be swapped out (depending on the water being fished) without changing the fly line. Note: To save time I actually carry two “pre-rigged swing rods” with me on the river (along with my nymphing rod) for personal and guided trips. One rigged with a medium sink tip for slower runs and pool tail-outs and the other with a faster tip for fast runs, pools and pocket water. This is obviously more easily done on float trips versus a walk-in trip. I started doing this after meeting an older gentleman in BC who rigged three spey rods up in his drift boat, each with a different sink tip. 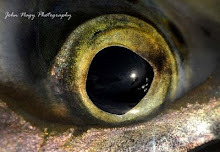 As he drifted down the river he would pick the rod with the right sink tip for the water being fished. Egg patterns will always be effective for catching Great Lakes steelhead because steelhead (a sub-species of the rainbow trout) inherently eat fish eggs. Since fish eggs are typically bright in coloration, you want to obviously match that in your egg patterns. 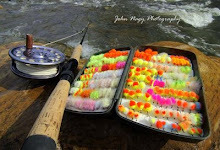 Large, bright egg flies (size 10 to 16) in chartreuse, orange, pink and red work well in stained water flows. As water conditions improve and clear up, smaller egg patterns (size 18 to 14) in more subdued tones or pastels like creams, light oranges, light pinks, etc. are the ticket. Metal or glass beads should be added to egg patterns to help them sink, especially those made with materials that have some buoyancy like Glo Bug Yarn. Effective egg patterns include the Cook Angel Hair Sucker Spawn, Letera Synergy Spawn, Scrambled Eggs, Glo Balls, Crystal Meths, Nagy Half-n-Half, Nuclear Roe Bugs and Blood Dots. Lake Erie steelhead really key in on nymphs, especially in lower, cleaner flows. A brass, tungsten, or glass bead will help get them consistently down and drifting naturally along the bottom in a variety of run-off conditions. Brass or copper ribbing as well as lead under-wrappings will help nymphs sink quicker, thereby requiring less shot to be used. Thinner profile nymphs will also sink faster than bulkier patterns, which is a definite advantage in faster stream flows. Simple, general-purpose nymphs in black, gold, white, and natural are very effective for steelhead. Adding some type of flash material (and bright color) to their wing case, ribbing, or tail will make them more detectable by steelhead in stained water. Some specific nymph patterns that are hot for steelies include the Prince nymph (including the flash version aka “the fly formerly known as prince”), Brugger Orange Flash Pheasant Tail, DeFrank Blue Steel, Rubber Legged Copper John, Nagy Black and Blue Stonefly and Steelie Rock Worm, Yerger Miracle Nymph, 60 Second Stone, Letera Luminus Maximus and Vidmar Woven Caddis. An effective technique is to fish an egg fly (top fly) in tandem with a bead-head nymph (bottom fly). The egg pattern acts as an attractor (especially in stained water) with the nymph as a teaser. 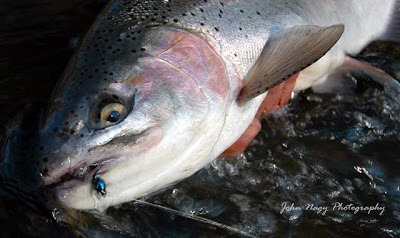 If the steelie doesn’t take the egg they will usually take the smaller, more buggy looking nymph which is nearby. The more closely you keep the flies together on the leader the more effectively the tandem fly technique works. You can also use a streamer as a dropper in this technique. When tributary water temperatures are over 40 degrees F (in the fall and early spring) steelhead are very eager to take actively fished flies, especially on the downstream swing. Flies that impart the slightest movement and undulation in the water can prove irresistible to steelhead that are holding in faster current flows. Leeches, Wooly Buggers, spey and tube flies, soft hackles and traditional steelhead wet patterns can induce explosive strikes which are far from the soft takes that are characteristic of dead-drifted nymphs and egg patterns during the late fall and winter. Post-spawn steelies are particularly fond of any baitfish imitation fished during their “drop-down” mode to the lake. The vigor of spawning gives these slimmed-down steelies voracious appetites and they will strike streamer patterns with seeming abandon. Effective flies for swinging techniques include the Guida Mirrored Minnow, Darkes Funny Bunny Emerald Shiner, The Weamer, Chandler Pink Matuka Spey, German’s White Nightmare, Ken’s Beady Zonker, Nagy Lake Erie Rainbow Smelt and Lite Brite Intruder tube flies and DiBennedetto Mini Steel tube fly. 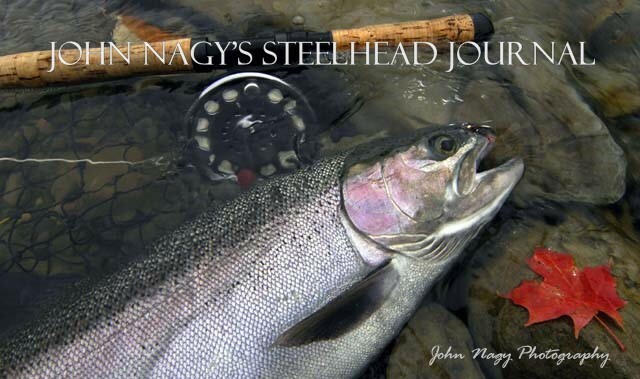 More detailed information on Great Lakes steelhead techniques, equipment and flies (including many of the fly patterns mentioned in this article) can be found in John Nagy’s book “Steelhead Guide, Fly Fishing Techniques and Strategies for Lake Erie Steelhead”.